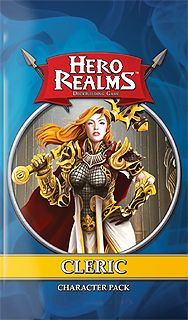 Play Hero Realms as a holy Cleric. Heal the injured and lead your devout followers in battle. With your faith (and your mace) prepare to smite the wicked! This character pack replaces a player's personal deck in the Hero Realms Deck Building Game. Included are 15 cards: a Cleric character card, the Resurrect and Bless ability cards, two unique score cards, and a new ten-card personal deck (Prayer Beads, Spiked Mace, two Followers, and six Gold).